Complete the form, including state, district, and school. Click the ‘activate account’ link in the verification email. Re-open OKTOPUS, go to the settings icon. Select ‘Log in To My Account.’ Enter username (email) and password to setup in registration. Check the ‘Save Credentials’ box. Click on the tools icon. Click on the ‘Standards Tools’ button, then select ‘Lessons’ from the menu. Click on the ‘Lessons’ icon. In the search field, type “fiction.” Find “Elements of Fiction and Nonfiction (Lesson)” then click ‘Download’ and save the lesson to your PC. Then, download and save “Elements of Fiction and Nonfiction (Questions)”. It is always helpful to review any lesson before presenting to the class, but this lesson is ready to go even if you don’t! Did I mention it is click-play simple? To present the lesson, click on the settings icon. Select ‘Start Session’ and begin the lesson. This setup will include a quick tutorial on how students can join in the lesson using their devices. 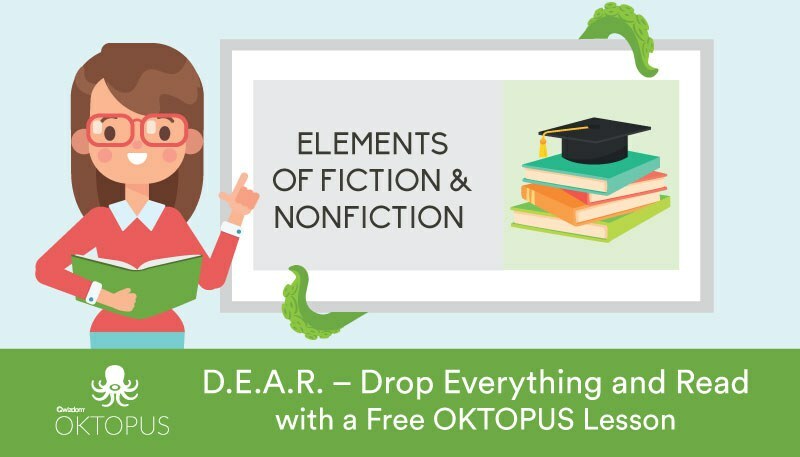 Navigate through the lesson which compares and contrasts fiction and non-fiction, including identifying the type of book based on titles (a common test question!). At the end of the lesson, click the settings icon and select ‘End Session.’ If you want to continue with the question set, simply go to the file icon and select ‘Open’ and look for the question set. Repeat the steps for starting, navigating through, and ending a session. Of course, you can always ask impromptu questions by using the Vote Tool. Click on the ‘Standards Tool’ button and select ‘Vote Tool’ from the menu. From ‘Question Tools’, select a question type. Polling questions foster engagement and boost discussion. For more on how to set up a presentation and question types, go to https://qwizdomoktopus.com/user-guide/. Save any annotations made in the lesson simply by selecting “Save as” at the end of the session. So, this month, as you encourage your students to READ, READ, READ why not take advantage of what Qwizdom OKTOPUS has to offer! If you want to know more, go to https://qwizdomoktopus.com/ and sign up for a free 30-day trial.